Cam has been working with the MSG since 1996. He has been coordinating upriver restoration projects for the MSG since 2000. Cam also coordinated MSG spawner surveys for 10 years (2003-2004 to 2013-2014 seasons). 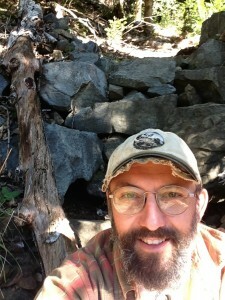 Cam has constructed over 200 structures in the Mattole River and nearby watersheds. He has served on the MSG Board since 2004. Cam’s background also includes a variety of work with our partner organizations. Cam has worked for Restoration Forestry Inc. (RFI) since 1997 coordinating a wide range of restoration, biological monitoring, sustainable forestry and land management projects. In addition to his instream structure work with the MSG, Cam constructed instream structures with the Mattole Restoration Council Good Roads, Clear Creeks program for 5 years and several projects with RFI. His biological experience also includes working with CA Dept. of Fish and Wildlife for 3 years as a Scientific Aide with the Steelhead Research and Monitoring Program. Cam did wildlife surveys with the Humboldt State University Foundation for 5 years and has continued conducting Northern Spotted Owl surveys as a consultant ever since. He has served on the Sanctuary Forest Board since 2006. Cam has a Bachelor of Science in Biology; Ecology, Behavior and Evolution from UC San Diego (1992). He lives in the Mattole headwaters with his partner, Michelle, and their daughter, Azalea.